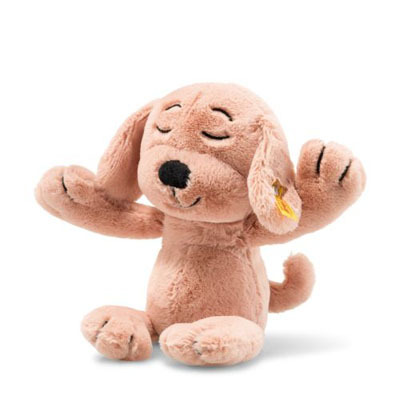 Soft Cuddly Friends Caramel dog measures 30 cm and makes a great gift for any occasion. His closed embroidered eyes, eyebrows and sweet smile make you wonder what the peach coloured Caramel dog made of cuddly soft plush is dreaming about. Thanks to the bean bag in his tail, Caramel dog can also sit outside the bed.